Now you can share your prepaid account balance to your friends, family members or any other person. But you can transfer only same mobile operator that means suppose I am using aircel mobile operator and you also using aircel mobile operator then only it’s a possible otherwise you cannot transfer to someone. 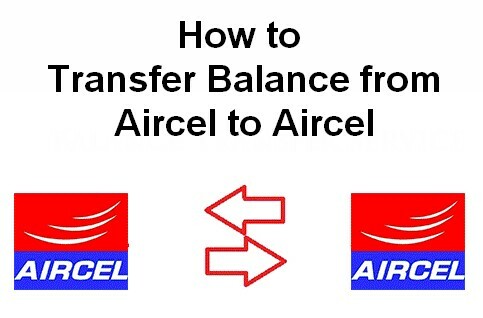 You did not know how to transfer mobile balance in Aircel, do not worry here I will try to explain how to transfer mobile balance from aircel to aircel. You can easily transfer your balance to someone. While doing this process it’s take small amount of service charge. What you need to do is just simple dial the Aircel balance transfer USSD code and enters the amount that you want to share then enter your friend number. If you want to transfer your mobile balance to someone just follow here I will tell you how to transfer mobile balance from aircel mobile number to aircel mobile number. This process is allowing only same mobile operator. There are few terms and conditions before transferring your mobile balance. Your Aircel mobile number must be activated on before three months. The guy who receives your balance the person should be active on before one month and the starting balance is 5 rupees up to 100 rupees you can share your friend. You cannot transfer more than one time per day only one time and per month only 30 times. While doing this process the number must be in active mode. Let’s start the process. Just open keypad of your mobile. Enter the Aircel to Aircel money transfer code *122*666# and click on the call button. Now you will have to enter aircel mobile number to transfer your balance. Just type your friend number then enter the amount how much you want to transfer. Just press the “send” button. Once the message has been sent to your friend. Then you will receive full transactions details like the amount of money you transferred to your friend and the amount service tax you were charged for. I hope you have transfer your Aircel balance successfully. Just be care full while entering mobile number because sometimes you may lose your balance. So now you do not get any problem while doing this process. If in case you are facing any problem just comment on below. I will try to find out solution for your problem.